The first golf club set you buy needs specific features that assist with maximum forgiveness. Hitting the ball consistently every time is hard for a beginner or high handicapper but a true beginner golf club set will help out massively. The best golf clubs for beginners is the Callaway Strata Ultimate Golf Set, which is an 18 piece collection of clubs that are tailored for forgiveness and optimum control. Beginners that are just getting into the game do not want to be spending thousands as it may turn out that golf is not for them. Therefore most beginner golf club sets are cheaper than the more enhanced clubs for low handicappers. In terms of the major golf clubs that should be in your bag, they should include a driver, fairway woods, irons, wedges and a putter. Without these, hitting certain shots on the golf course may be problematic. 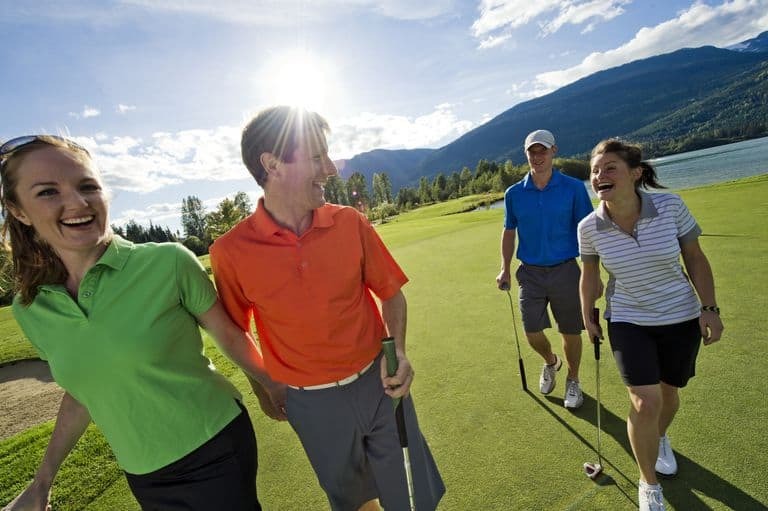 Having the correct golf clubs as a beginner will help you learn the game quicker and hit better shots, to begin with. Going straight for enhanced clubs with no forgiveness can ruin your motivation with inconsistency with your shots. Avoid listening to pushy salesmen in your local store that try to sell you undesirable clubs and purchase a true beginner golf club set. Below is a list of the best golf clubs for beginners that are focused on forgiveness and control. The Strata Ultimate beginner golf club set by Callaway contains a complete selection of 18 clubs that focus on more forgiveness for consistent shots. Including within the Strada package are a driver, 2 fairway woods, 2 hybrids, 4 irons, 2 wedges, a putter, lightweight stand bag, and 5 headcovers. Every club has an element of design that is tailored toward forgiveness. For example, the driver has an above large sweet spot for extra forgiveness from the tee and the stainless steel irons have high flight technology for additional control. Even the putter has a precise face milling design for extra distance control for a smooth rolling putt. 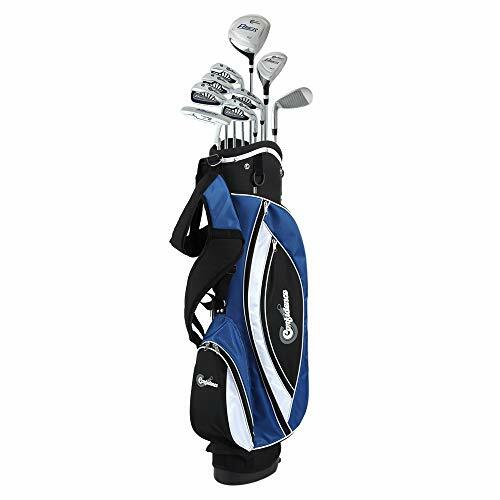 The whole set of clubs also offer excellent value for money considering that head covers and a bag come with the complete package. 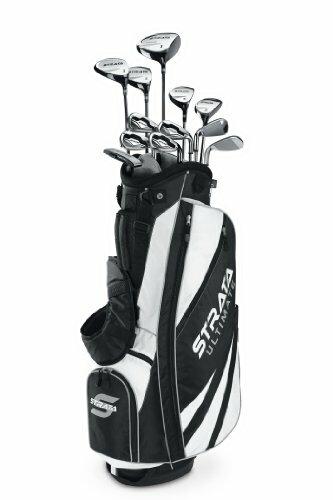 Overall, the Callaway Strata Ultimate set are the best golf clubs for beginners that will not disappoint. 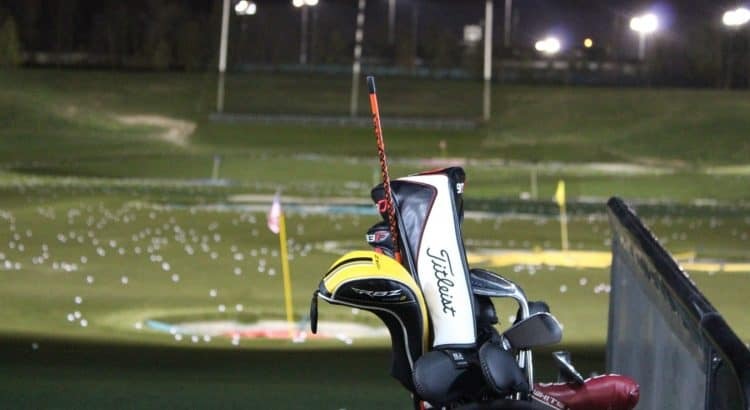 Whether you are a high handicapper looking for an excellent set of clubs to improve your game or you are just getting started, these are the clubs to get. 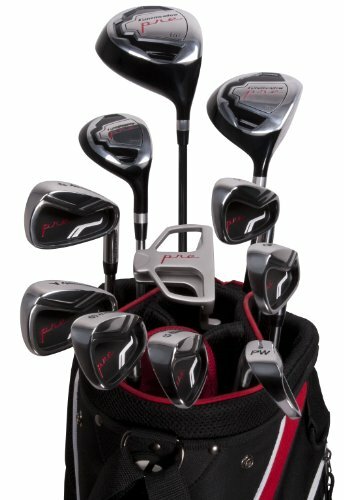 The 16 piece complete golf club set for beginners is highly popular with a graphite shaft driver and woods with stainless steel irons. This is a recipe for a durable set of clubs, which is perfect for a beginner that may hit the ground harder than the ball. Included is a titanium-enhanced driver, 3 wood, hybrid wood, 4 to 9 irons, pitching wedge and a mallet putter. To carry the clubs around the course, a high-quality bag with kickstand and a dual strap is also included within the complete package. It is an averagely priced set of beginner golf clubs that are very high quality compared to similarly priced sets. Graphite shafted woods and stainless steel irons are an example of such quality that is not found on others. The latest set of clubs by Cobra are designed with forgiveness in mind so that a beginner can enjoy golf straight away. Included are 12 clubs and a cart bag for transporting the clubs around the course. Cobra integrate the E9 Zone Face that has the effect of increase ball speed and distance on off center hits. This is great for beginners as there will almost certainly be some mishits, which mean this will help with consistent shots. The set includes a driver, 3 wood, 5 wood, 4 and 5 hybrid wood 6 to 9 irons, pitching wedge, sand wedge and putter. It is rare to find a beginner set of golf clubs that include both wedges and avoid the long irons, which is a big bonus. Long irons are notoriously difficult to use for beginners with hybrid woods used instead just like this set. Overall, the Cobra golf club set for beginners is a great all-rounder with the only drawback being the slightly expensive price. 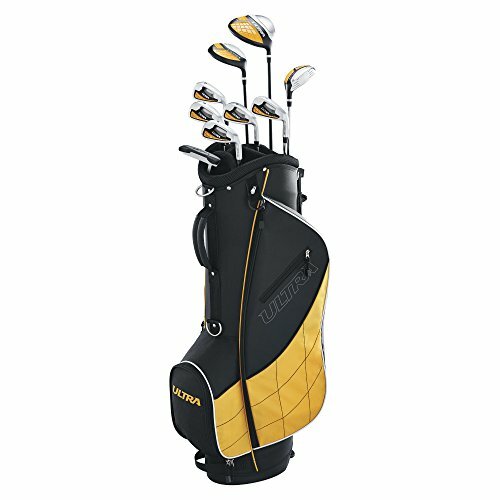 The Wilson ultra is a 14 piece beginner golf club set with 10 clubs, 3 headcovers and a golfing bag. It has everything you need to get started with golf on a budget. Spending large quantities of money on a golf club set can be a worry as you do not know how long you will be playing for. Some beginners continue the game and go on to become low handicappers and upgrade to a professional set of clubs. Whilst others may only want a set of clubs for the weekend or the occasional round. Including within the 10 clubs are one driver, one 3 wood, one hybrid wood, 5 to 9 irons, pitching wedge and a putter. There are various “editions” that Wilson produce but the 2015 edition is very popular due to the durability and low cost. Wilson has produced a cheap beginner golf club set that actually performs. They are the best cheap golf clubs for beginners that are looking for an affordable option for their first set of golf clubs. If you are on a tight budget or simply going on a golfing trip and want a complete set of clubs that won’t break, Confidence golf have a cheap alternative. They are not a popular golfing brand such as Callaway or Titleist but don’t let this put you off. The cheap golf club set includes a driver, hybrid wood, 6 to 9 irons and a semi mallet putter. Due to the low cost, this set will not win any awards for extreme quality but this is to be expected. Included is a decent golf bag with straps for easy carrying, which would have set you back a fair amount if bought separately. One thing that you will need is a sand wedge because there isn’t one included unless you plan on using a PW in the bunker. Confidence Golf offers an entry level beginner golf club set with much better quality compared to the other low-cost alternatives. However, if you can stretch to the Wilson Ultra set of clubs, it is highly advisable. As with any sport, the equipment can greatly affect your game. Nowadays, it can be difficult to find out what suits your need and game with the sheer number of products, brands, and types of equipment in the market. Our buying guide will help you further understand the characteristics of the various modern golf clubs. The beginner, or standard, clubs are designed to be used by an average duffer. These are the individuals, also referred to as the Weekend Warriors, who wish to play as much as possible, but rarely devote time to actually practice the sport. These Weekend Warriors account for nearly 99.9% of the playing public. These beginner clubs are manufactured to provide novice golfers with the best ‘mis-hit’ possible, which just means that they have a larger ‘sweet spot’ to get the ball moving further even if the hit wasn’t square on the club’s face. Typically, you’ll find that beginner golf clubs have a slight offset that promotes a straighter flight which then also reduces the ‘slice’, which is one of the most common misses from novice and average golfers. On the other hand, professional, or tour, golf clubs are designed with an experienced player in mind. Ideally, the player could be anyone who plays on a tour, has the possibility of playing on a tour/mini-tour, or aspires of playing on a tour. Physically, professional clubs are smaller and have a thinner top line, and a smaller ‘sweet spot’. Additionally, the also have a less to none offset. One of the biggest advantages of professional clubs is their workability, which allows the golfer to hit shots both right and left on demand. If your scores are in the mid-seventies to low-eighties, then chances are that your chances of playing on the tour are slim. As a beginner, it’s not necessary for you to have a full set that usually consists of fourteen clubs. Instead, you will be fine if you have anything between nine to ten club selections. This helps you practice better with the set that you have. Drivers are one of the standard clubs that are a necessary part of any golf set, regardless of whether you are a professional or novice. It is also one that hits the furthest distance, which makes it perfect to use as the first club of the game. A driver can be told apart as it has the smallest loft, largest head, and longest shaft. However, due to the long shaft and low amount of loft, it can be one of the most difficult clubs for golfers. Fairway Wood is the club that you need to take shots once you get on to the fairways. These clubs have a shorter shaft and head, which makes it smaller than the driver. However, unlike the driver, fairway woods offer you with more accuracy but at the price of distance, as it offers a less range. These clubs should be used when you are more than 175 yards from the flag. Irons are the ideal club to be used when you are 200 yards from the green. There are seven types of irons (3, 4, 5, 6, 7, 8, and 9) that make up for the majority of your club set. The rule of thumb should be, the closer to the green you are, the higher the iron you should use. Hybrids are one of the most recent developments with golf clubs that came around roughly ten years ago. A hybrid is basically a wood head and iron length shaft design. The great thing about hybrids is that they give you the best capabilities of a Wood Club and an Iron Club. Most advanced players choose to replace their Wood 7 and 9’s as well as their Iron 3 and 4’s with hybrid golf clubs. Wedges are special variations of irons that help with particular shots. The most important one is the Pitching Wedge (PW), which comes with a 46 and 48-degree loft. The loft advances by four degrees, which means that they come in 48, 52, 56, 60, and 64. These are generally more useful the closer to green you are. Their design emphasizes the shot control and shot shaping. Putters have the primary purpose of putting the ball in the hole. They help you as soon as you get on the green and are also great for getting your ball out of the sand traps. These clubs come in various styles, such as center-hosel, mallet, heel-toe, short, belly, bent, long, and more. The Shaft is the long rod between the club head and the grip. It is one of the most critical parts of a club, which means that it’s something that should be looked at while purchasing a new one. They are usually made from graphite or other metals, with the length depending on the type of club. These labels show that beginners should go for those clubs that have either A or M printed on them, as that will be the ideal club for your performance level. Generally, the same technology is applied to women’s golf clubs as is applied to the men’s. However, there are slight differences between the two, such as the ladies’ clubs being more flexible, lighter, and shorter than men’s. One of the most obvious changes is the color, while men club grips or shafts come in solid dark colors, women’s often come in lighter, pastel colors. In terms of drivers, women’s drivers have a twelve-degree loft minimum, while men’s usually have around nine to eleven degrees. The higher loft degree is to allow women to get their balls in the air more easily, as the clubs are also lighter. These differences allow women to get a higher trajectory, speed, and distance. Women’s Fairway Woods also have a higher loft degree and are lighter than the male counterparts. They also have a larger range of clubs that go up to a 13-wood. Women’s Irons have a slightly heavier club head, but a softer flex. These also have a shorter shaft, as women are often shorter in stature compared to men. In terms of the shafts, women clubs tend to have shafts made out of graphite instead of steel. These allow for a softer flex. Women’s grips are also smaller and shorter than men’s, as women generally have smaller hands. Beginner golfers might find themselves wondering whether they should settle for used clubs or invest in a new set. Both are readily available to be purchased from various stores online and physical. It becomes one of the most difficult and important decisions golfers make in the beginning. If you don’t think that you’ll be playing golf in the long run or too often, then you might find yourself leaning towards the used golf clubs. These are generally cheaper than their new counterparts. If used clubs are damaged then it’s not too heavy on your wallet to get new ones. However, with new ones you can choose which type you want to get. These might also be of higher quality and higher durability than used ones as you will use them for the first time. If you invest in them, you’re likely to take better care of them and be pushed to use them more often. Whether you went the route of purchasing a used club set or bought a new inexpensive beginner set – there will come a time when you have to upgrade your gear. However, that does not mean that you constantly need to upgrade or change your clubs whenever a new model comes out or you see an advertisement. It’s actually worthwhile for you to ignore the buzz around newer products. Instead, pay attention to the wear of your gear. If you are not wiping down your gear after each round, which you should be doing, they will wear out faster. It should also be noted that different clubs wear out at different rates. Generally, the driver and wedge will wear out first, while long irons last for years to the lack of use. Your fit is likely to change as well which might affect your swing if you are using the incorrect club. Many beginners will decide to upgrade to a golf driver for distance in order to improve their game. However, this is all dependent on what you believe will lower your scorecard. The short answer to this is, yes. Most of the issues that beginners tend to have are the same issues that high handicappers have. The larger head size of a driver, the low center fairway wood, among others – will help both, beginner, and high-handicappers to better their game. It’s understandable that as a beginner you’ll have a hard time choosing the right equipment and playing the game well. This might simply be because of the lack of information that you find or look for. Golf is a complex game, even more so because of the various clubs that you need to have for a single game. It’s not hard to find the various clubs that you need, but it is difficult to know to actually look for. Everything that we’ve mentioned above should be kept in mind while looking for your perfect beginner golf club set, including the types of clubs you need, the shaft options, new or used, club fitting, budget, and customer reviews. Before you go shopping though, you should decide on your goals as that might change the type of things you look for. If your goal is to end up on tour at some point, it might be worthwhile to invest in better pieces. However, if your goal is to simply play a couple times a year, then it’s not necessary for you to spend too much. The club fitting is an important factor to consider before committing to a club set. If you are a 5 feet 10 inches man, then the standard ones at sports shop will be fine for you. But if you vary even the slightest from that description, then it’s necessary for you to undergo club fitting to find a club that suits your body type. The fitting is actually simpler than it might seem, as you need to take measurements of certain body parts, such as measuring the length of your arms and your height. It takes less than an hour but will ensure that you find a club that is comfortable for you. Another aspect to consider is your budget. Similar to other golfing gears, clubs can get very expensive as you start to research. They especially add up in costs because of the number of clubs that you need per set. So, it becomes almost necessary for you to set up a budget to ensure that you don’t go over it and over-spend. The budget is often built based on your dedication to the game. If you intend to regularly go and play, then it might be worthwhile to invest in some high-quality pieces. As a beginner though, it’s recommended that you don’t spend too much from the get-go.